Wanna wake up that zombie grilled chicken sandwich? Try this simple sauce made with ssmajang, an amber ambrosial dip that accompanies so many meals at the Korean table. Mix equal parts ssamjang and mayo—now that’s a ssamwich! It keeps everything moist and lends a tangy, sweet and savory flavor with just a hint of spice. I swear it reanimated this leftover grilled chicken. Lay down a thin blanket of sliced cucumber for a wet crunch in every bite and serve it on a toasted English muffin or in a pita. The only thing better is another ssamwich with bacon. Take a dip! The sauce is fine. Ssamjang (“wrap paste”) is an amber ambrosia that’s used for assembling a ssam dish of grilled meat and rice folded into packets of crisp lettuce or fresh sesame leaves. Made with Korean chili paste and soybean pastes, it’s blended with honey, sugar, roasted sesame oil, garlic and ginger to create the perfect balance of sweet, savory and tangy flavors with just enough heat to sweat the brow. I mainly use it for dipping sauce, but as the grill chef at the Memorial Day BBQ at Freddy’s Bar I added ssmajang to the summer lexicon of sauces. I brought a small jar for basting burgers, salmon, hot dogs, kielbasa, veggie burgers—instant hit! It worked well as a spread for cheese pupusas and beer-soaked roasted corn too. Can you imagine a fried oyster po-boy drizzled with ssamjang and aioli? How about smoking a nice slab of brisket with ssamjang and peach preserves? I’m selling my vegan kimchee and 8 oz. jars of gluten-free ssamjang on the Sunday afternoons of June 1 and July 13 at the Gluten-free EatUP! Kimcheelicious Sanjang Suace is sweet, hot and tangy, made with all-natural ingredients with just a kiss of white rum—and of course it’s gluten-free. Swing on by, there’s a whole host of gluten-free vendors to meet. I’ll have free tastings from 1 to 5 PM. Try the chickpea ssmajang! 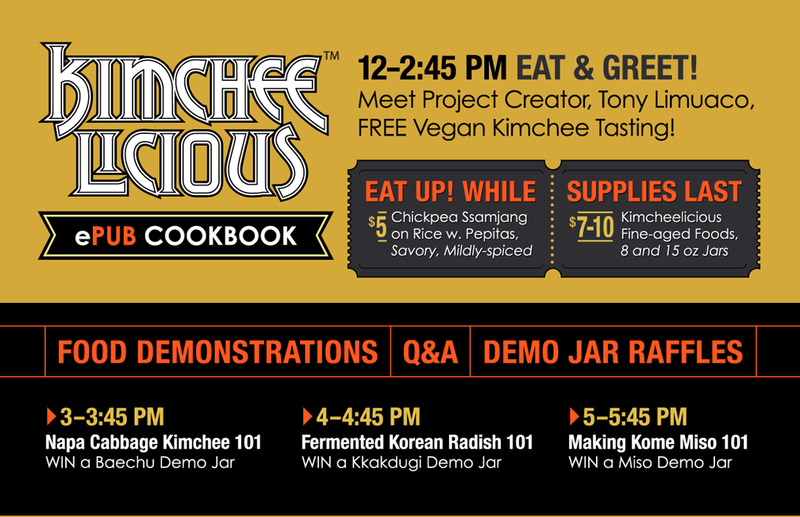 Here’s more info on purchasing Kimcheelicious jarred foods. Summers already here and it’s time to scrub down that grill. But for someone with celiac disease, a backyard party could be a horror show. Most recently a few of my friends have been diagnosed with celiac disease and are making major adjustments to the way they live and eat; In the US nearly 1 in 100 people have celiac disease. When consumed, gluten triggers an autoimmune reaction which causes the body to attack the cilia in the small intestine. The result is malnutrition and possibly irreversible damage. For some the experience is painful. As the BBQ host you don’t have to keep your gluten-free friends down in basement in hazmat suits. You can share the grill. Here a summer primer to remove the gluten gloom from your grill. Gluten is a protein naturally found in grains of wheat, rye, barley and spelt. It’s composed of two molecules, glutenin and gliadin; although these are naturally present in certain grains, gluten only forms when combined with liquid. Although some foods are free of wheat, rye, barley and spelt are free of gluten, contamination in a shared kitchen is a possibility. The FDA defines GF food standards as containing levels less than 20 ppm (parts per millions), meaning that in a million grams (one metric ton) of food only 20 grams of gluten are acceptable. Do a little online product research. If there’s a type of food that you want to share (chips, mustard, BBQ sauce), search online for reviews and visit the manufacturer’s web site to make sure it’s made properly. You can also email or call them. I’ve found that Goya can not guarantee GF production at this time, but Bush’s Best canned beans are made in a facility that is free of gluten. Meats, cheeses, eggs and vegetables in general are fine for people with celiac disease, but watch for packaged foods and bottled sauces. Even though they may be labeled as gluten-free, read the ingredients list to be certain that they do not contain an offending grain; FDA enforcement of GF claims are not official until August of 2014. Oats in particular may be cross contaminated with wheat product unless it states “gluten-free oats.” Some foods are labeled as “Gluten-free but made in a facility that also processes wheat”— just to be safe, avoid foods with this disclaimer unless you know someone with celiac disease who can vouch for the product. Aluminum foil is a celiac person’s best friend at the grill. Although that grill may never come clean enough, you can cover an area of grill with heavy duty aluminum foil and brush it lightly with high-heat oil (peanut, canola, vegetable, etc. ), grill as usual. If your meal needs a little board prep, cover the cutting board with foil. For foods like grilled cheese sandwiches, wrap them in lightly greased foil and toss it on the grill; this works well for corn, portobello mushrooms and vegetables too, just throw some butter and salt in before you seal. Simply discard the foil after use. Gluten can NOT be removed from wheat, nor can it be neutralized at grill or oven temperatures. According to cereal food studies it will disintegrate at 800°F / 426.67°C and above. That’s great if you like pizza ashes. A more practical method would be to deconstruct the two gluten components on your kitchen tools. Glutenin is soluble in light acid or alkali solutions; gliadin is soluble in a 70% isopropyl alcohol solution. The later is potentially hazardous and more appropriate for surgical tools, but in a pinch this works well with non-serrated knives. Just keep it away from open flames. You can share pots, pans, and bowls made with stainless steel, aluminum/alloy or pyrex after a vinegar or bleach treatment. Any protein that is treated this way it will never reassemble. Follow these instructions and store your wares away in a clean, dry place to avoid cross contamination. Use these only for cooking and preparing GF foods. • Acid Solution: Mix 2 cups of distilled vinegar to 3 cups of water with 1/2 tsp dish washing liquid. • Alkali Solution: Mix 1/2 cup bleach to 5 1/2 cups water with 1/2 tsp dish washing liquid. Step 2: Follow with washing and scrubbing with hot tap water and dish washing detergent, rinse well and repeat if needed; use a toothbrush for tight areas. Dry and store away in a clean area that is not shared with other kitchen items. This treatment should be also used when sharing stainless steel/alloy forks, spoons, tongs and kitchen knives. Other items should be purchased new and kept separately. Here’s a list of items that you should never share. Never share a deep fry-set up or the frying oil. Also avoid sharing toasters, food processors and mixers; their complex structure and many surfaces make it hard to absolutely treat and clean.This sounds like a lot to remember, but the key is to simplify what you use. To avoid contamination gluten-free foods should be stored separately from other kitchen tools. When your on the go at a picnic, Use plastic zip-lock bags, plastic wrap and plastic or glass containers for temporary storage. There’s been and explosion of GF baked goods, but they come at a price; the ingredients to make these goods simply cost more. GF bread, rolls and most pastries freeze well. For long term storage wrap them in plastic wrap and aluminum foil before freezing and remove most of the air first. If you have a vacuum sealer system this is ideal. Use clean glass jars for storing GF sauces, pastes and liquids; baby jars work well for spices but lean them as described above before hand. Mark your calendars! 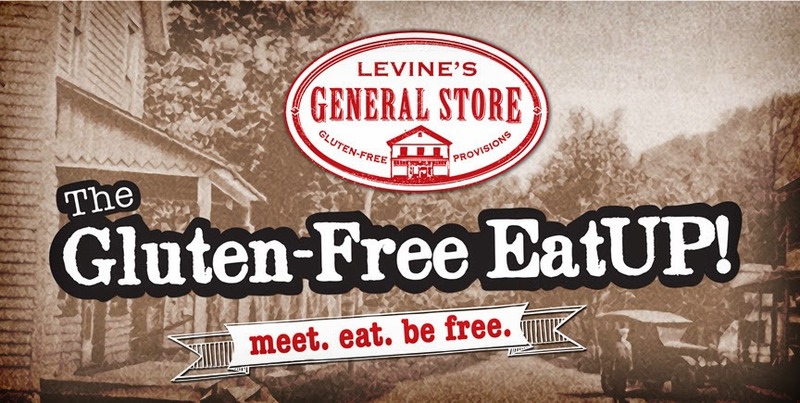 Levine’s General Store presents the Gluten-free EatUP!—a pop-up market dedicated to locally crafted gluten-free foods. This special culinary event is sponsored by Levine’s General store and in part by Kimcheelicious—we bring the best gluten-free food makers to you. Taste, purchase and mingle over a cool libation; grab a gluten-free beer at the bar. There’s sitting room for chilling... inside or out-back. Meet our new merchants and our returning favorite vendors. 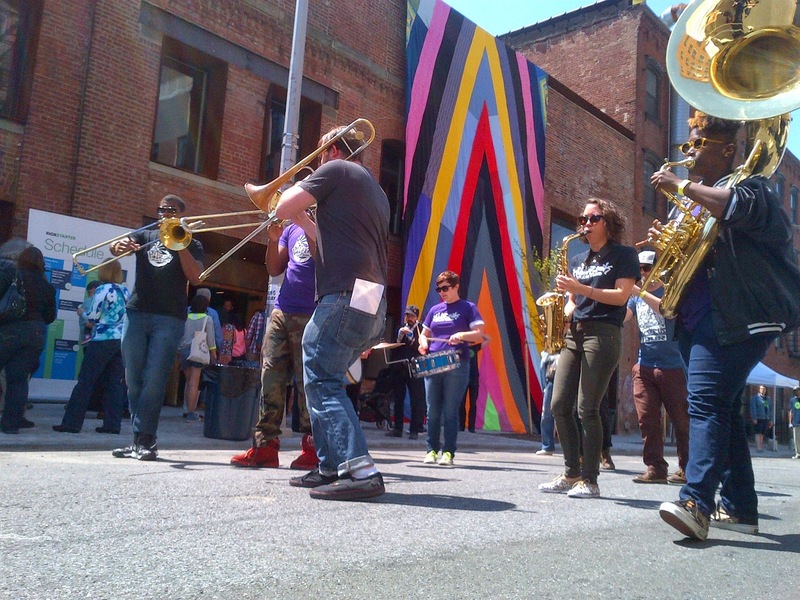 This all happens on Sunday afternoons, June 1 and July 27, in South Slope Brooklyn at Freddy’s Bar. Hope to see you there, tell a friend! Say hello to our new gluten-free kids on the South Slope block! • Bija Bhar, spiced coconut, sesame and chia seed energy bars with a kiss of cayenne for GF peeps on the go. • Gone Pie has lip-smackin’ confections and chocolates... and of course pie! • Levine’s General Store, Yum Pies (vegan hand pies) and delicious grilled cheese sandwiches! Sodium chloride (NaCl) is better know as common table salt, although its history is far from common. Aside from its use as a seasoning for food it was once an important part of world economy—used for trade and as currency (hence the word “salary”); wars were fought (El Paso Salt War) and political agreements (Gandhi–Irwin Pact) reached over this white gold. Salt technology has long been essential to medicine and science; it’s responsible for most of our bodily functions. On average the human body is composed of .4% sodium chloride. Thus a person who weighs 110 lbs (50kg) is composed of 7 oz (200 g) salt; that’s 13.33 tablespoons, but some people are saltier dogs than others. About 3.4% of our oceans’ weight is attributed to dissolved salts, though less than that in the polar regions due to melting ice... but that's a whole other topic. Long before refrigeration, salt was ubiquitous to food preservation; fermented vegetables and cured meats extended food long after the harvest and the hunt. In an airless, saline environment, most microbes will not survive with exception for some—mainly lactic acid bacteria (LAB). As the bacteria establish and colonize, they create an acid environment which preserves food. LAB is beneficial to our bodies, processing food into micro nutrients and synthesizing sugar and other compounds into amino acids. Given the correct conditions it also combats pathogens such as the microbes that cause botulism. To create an environment that best suits LAB fermentation, it’s recommended to make brine that’s anywhere from 2 to 10% salt—by weight, not volume. Not all culinary salts are the same as they vary in flavor and mineral content. For fermentation I use a combination of sea salt and kosher salt; these are free of anti-caking agents (sodium aluminosilicate, potassium ferrocyanide) and iodine. These salts are readily available in grocery stores and are of relatively consistent quality. When I make kimchee, I salt and rinse my vegetables first to break down the cellulose in thick stems, followed by resting in 1% brine for 8 to 12 hours to further condition the cabbage. In an aqueous solution the salt molecule (NaCl) breaks down into sodium and chlorine—sodium is the active ingredient in brine. Sodium penetrates cell walls which catalyzes osmosis—internal liquids are drawn out then replaced by brine. Although 2% brine is recommended, I account for pre-salting and the salt content in my chili paste. Here is how I arrived at my 1% brine solution by weight and estimated volume. Let’s Mix a Gallon of Brine! Water: 139.2 oz (8.7 lbs) / 3.946 kg by weight is roughly equal to 1 gallon / 3.78 liter by volume. Salt: 1.4 oz / 39.5 g by weight is roughly equal to 5 tbsp / 37.8 ml by volume. If you use a very course salt, dissolve it in hot water first and let it cool and do account for the total weight and volume of the brine. For a 2% solution double this amount of salt; for 3%, triple this amount, etc. Preserving meats, cheeses and other non-plant foods calls for salinity of 10 to 20%; a salt environment above this would kill all microbes and spores and eventually you. Consuming foods with high sodium levels may lead to health problems such as heart and vascular diseases. Although lacto-fermentation will transform starch and sugar into beneficial acids, the level of salt that you establish stays the same, so be mindful of the food you make and eat. Share this knowledge, eat right and stay healthy. After salting and curing Napa cabbage in a 1% brine solution a dramatic transformation has been achieved. Thank you Victoria and Aurora and your wonderful Kickstarter staff! The Kickstarer 5th Anniversary block party was packed; the crowd was wonderful and friendly; we sold out of jarred kimchee, fermented Korean radish, Korean chili past, and Chickpea Ssamjang by 4:40PM. We met so many great, creative people yesterday afternoon (other project creators included), had a great time at the wrap party... now back to doing some dishes. Cheers and kamsahamnida to y’all, and thanks for making this ePUB cookbook project a success! 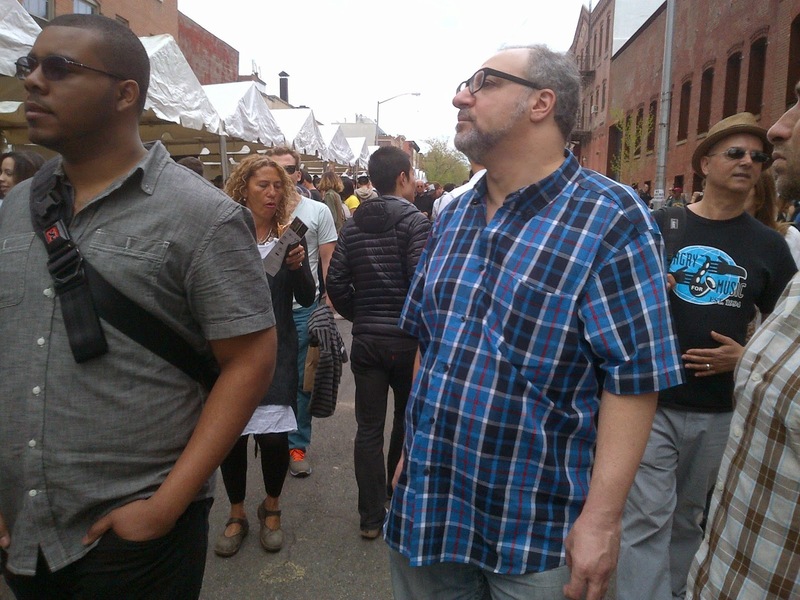 Here’s a write-up from Gothamist with event photos. Well, I’m all set up and ready for tomorrow afternoon as Kickstarter turns five! Join me at the Kimcheelicious Kiosk on Saturday May 3, from noon to 6PM for some rumination and demonstration. The new Kickstarter HQ is at 58 Kent St., in Greenpoint, Brooklyn. We have some fine spring weather ahead, but bring an umbrella just in case. I’ll have some hot fair food—Chickpea Ssamjang with toasted pepitas on rice ($5). And I’ll also have some jarred foods for sale—Napa cabbage kimchee ($10 15 oz. jar), Fermented korean radish ($10 15 oz. jar) and Seasoned Korean chili paste ($7 18 oz. jar). All these Kimcheelicious foods are vegan-veg, gluten-free and simply delicious. Eat-up and shop-up, supplies are limited. From 3–5:45 PM I’ll demystify fermentation with some kimchee and miso demonstrations—the demo jars will be raffled at the end of each session. Learn more about why fermented foods are important in our daily diet. There’s not need to register. For details, directions and more CLICK HERE.